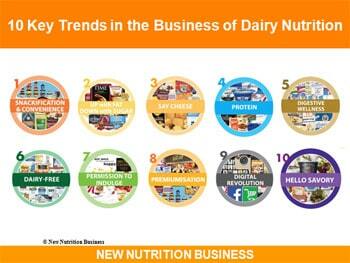 Reinventing cheese as a naturally-healthier snack is the biggest growth opportunity for dairy companies, reveals New Nutrition Business in its new report, 10 Key Trends in the Business of Dairy Nutrition. Cheese has had a major boost from scientific research showing that it is one of nature’s “naturally functional” whole foods, with no negatives either from fat or sodium content. Now, new sales numbers show that connecting cheese to the snackification trend spells market success. One of the most successful products launched in the US, with first year sales hitting $67-million, is Sargento Balanced Breaks, a snack that pairs cheese with fruit and nuts. Its winning marketing strategy highlights the convenience of a snack as well as cheese’s naturally-nutritious properties. And consumers are willing to pay a premium price for a cheese snack. Sargento Balanced Breaks retail at a 150% premium to regular mass-market cheese. “For profitable growth, premium niches are the highest-opportunity, least-risk targets in dairy. In almost every case the most effective strategy for profitable dairy growth is to begin by focusing on the low-volume, high-value segments of the market”, says Julian Mellentin, director of New Nutrition Business. Spire Brands is another company that found a simple solution for a growing consumer need. Its Moon Cheese snack (pictured above) – dried pieces of Gouda, Cheddar, or Pepper Jack in a convenient pack – hit a $10-million run rate in early 2016 with prospects to double annual revenues to about $20-million in 2017. For years cheese has been out of favour because of its high fat content and faulty research linking it to cardiovascular disease. But new consumer awareness about the health benefits of cheese means there is scope for growth in countries where cheese consumption has been low. If Americans were to reach the same per capita consumption of cheese as France, for example, the US market would double in size. Just when a critical mass of science revealed that dairy is a natural whole-food with a wealth of health benefits, it is faced with some new negatives (thanks to online bloggers), and these are helping fuel the dairy-free trend. “Non-dairy dairy is both an opportunity and a threat. Dairy companies must take note of the trend and know how to respond to it – which in many cases means entering the market,” says report co-author Joana Maricato, senior market analyst at New Nutrition Business. Danone has turned non-dairy into an opportunity by acquiring WhiteWave, thus becoming both one of the world’s biggest dairy companies and the world’s biggest non-dairy company. Almond and coconut milk brands have been capitalising on people’s interest in digestive health (one of the most powerful trends in the food and beverage industry), positioning themselves as “easier to digest” than dairy milk. Addressing people’s worries about dairy and digestive wellness presents a wealth of opportunities for dairy, as the A2 cows’ milk brand has demonstrated in Australia, where it has taken a 12% share of the liquid milk market with its “easy to digest” marketing message. Dairy companies are today presented with some good opportunities for profitable growth at good margins – if they can connect to the key trends (graphic above). Dairy has long been one of the most creative categories in the supermarket, possibly rivalled only by beverages in creating new product types and bringing new benefits to the consumer. At the same time dairy is faced with a distinct and growing competitive threat – one that some companies are already turning into an opportunity. A major advantage for dairy is that science shows it is one of nature’s “naturally functional” whole foods. For 30 years health professionals demonised dairy for its saturated fat content – creating the market for low-fat dairy products. But as research rolls back the negatives about dairy fat – its connection to risk of cardiovascular disease has been firmly debunked – dairy is undergoing a health re-birth, its health benefits putting it on a par with almonds and blueberries. This positive image means dairy products can be positioned as both healthy and indulgent, and many successful brands offer “permission to indulge”, capitalising on dairy’s taste and texture advantages. Move away from low fat: As a result of new science about dairy’s health benefits, in some markets the most health-informed consumers are buying more full-fat products while sales of low-fat are flat or falling. 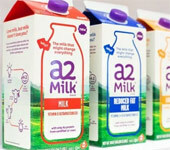 Some brands have given up offering low-fat variants and successfully focus on the taste advantage of “made with whole milk”. In most markets, it will take 20 years before consumers understand that full-fat is a healthy option, but the trend is clear. Cheese is one of the biggest beneficiaries of the science-based re-birth of dairy: There no negatives associated with cheese from the fat or sodium and it actually confers some health benefits. Snacking is the biggest growth opportunity for cheese and a few companies are already getting more sales at higher margins from focusing on snacking. The demonisation of sugar has dairy companies busy working out how to meet consumers’ demands for lower sugar products: Wise companies will simply lower sugar levels and increase fat and avoid the taste and cost problems of using sweeteners. The strongest way to deal with consumers’ need for lower sugar products is to re-educate them back into the taste and health benefits of full-fat. The premiumisation trend is a key opportunity for dairy companies. As consumer beliefs about health fragment massively, the niches collectively are eating up the mass market, starting in the wealthiest countries. Premium niche brands are achieving good growth even as commodity brands stagnate. A portfolio of low-volume, high-value niche brands is the way ahead for profitabilityin almost every case. Begin by addressing the lifestyle consumer who is willing to pay a premium for a healthier product. The high-volume commodity focus of many dairies is a mistake, unless you are the one or two players who can dominate the low-cost part of the market using price – but even then you will be under constant erosion from private label and your volume may be flat or declining as consumers become ever-more educated about health trusted brands and switch to premium brands, if not for all their dairy purchases, at least for some. Single-serve and snackified products have to be part of every company’s strategy. This is one of the strongest ways to get better prices and better margins. Single-serve on-the-go products are better aligned to modern lifestyles than the traditional family-oriented bulk packs which have been the focus of many dairy’s manufacturing-led, commodity-based strategies. Protein continues to be a growth opportunity, particularly in Asia and the Middle East, where the market for such products is at Day 1. Consumers see protein as a benefit, and the most health-aware know of protein’s connection to healthy weight and body composition. Protein is slowly taking over as the ingredient most associated with weight management. Non-dairy plant milks successfully use the message of better digestive health as a way of positioning themselves against dairy. Much of the negativity about dairy that is eroding dairy in some markets – and is going to erode dairy even more – arises from consumers seeking digestive wellness and associating it with dairy-free. Digestive health is a major “wellness” issue for many consumers and has been a growth driver in many categories for over 20 years. Companies have treated digestive wellness and the free-from markets (meaning gluten and lactose-free) as separate. But they are in fact the same market since gluten-free and dairy-free/lactose-free connect very strongly to digestive health. When people reduce dairy or lactose, they report that they “feel the benefit” – one of the most important reasons for anyone to buy a healthier product. “Non-dairy dairy” is both an opportunity and a threat: All dairy companies must decide how to respond to non-dairy – in many cases that will mean entering the market. In 2016 both Danone and Coca-Cola became major players in “non-dairy dairy” through acquisition. Danone is now one of the worlds’ top-10 dairy companies and also the world’s biggest player in the non-dairy milks market. Companies must push back against attacks on dairy: Just when a critical mass of science is revealing that dairy is a natural whole-food with a wealth of health benefits, it faces a growing tide of new negatives, spawned by the digital revolution and social media. Attacks on dairy are going to increase in intensity and frequency, and dairy companies need to communicate the many science-based health benefits of dairy. Increasingly consumers are personalising their diets as they make their own food choices, tailored to their beliefs and lifestyles. The digital revolution is making every consumer into their own health and nutrition expert by giving them access to an unprecedented amount of information on their portable devices. This comes at the moment when “expert advice” has a credibility problem because of the failure of low-fat diet advice (and many other examples of poor expert advice). Clean label does not create a point of difference and there is no evidence that going clean label delivers increased volumes or higher margins. Offering consumers products that are “clean label” has simply become “table stakes” in most countries – it’s just what consumers expect you to do. In fact in many markets people still place taste, price and other factors above clean label, even in the US. Clean label is not a growth trend. GMO-free has little or no effect on consumer behaviour in most markets. While the GMO-free message is becoming more common in the US and Japan, there’s no evidence of it creating growth.